A facebook friend linked to this Judge Judy youtube clip and I recognize that second dude as an artist I knew in Richmond... Brian Blomerth. 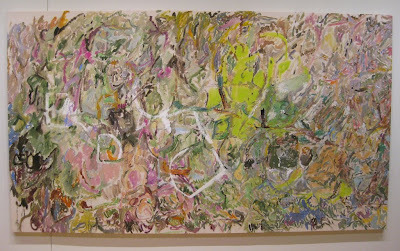 Brian Gahona aka John Xero's Whitney Biennial Rorshach Test. My link is to Damien Crisp's site... then you have to click on the pdf. Do it! 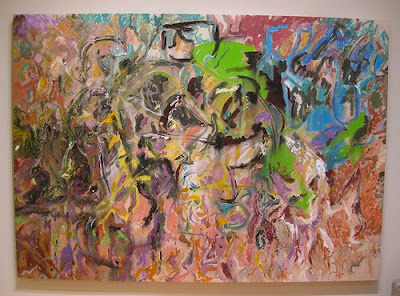 "I, for one, would rather see a tightly organized overview of Mr. Zucker’s work than Marlene Dumas’s warmed-over Expressionism, which was recently displayed in bulk at the Museum of Modern Art"
Strange sour note in an article that otherwise didn't have a bad thing to say about a single artist, and a lot of artists were named. What is up with them and Dumas? To borrow one of JS's shopworn phrases, it's as if she is living rent-free in their brains. Weird. I don't get how JS keeps up this appearance of being a champion of women. How many reviews dedicated to the solo show of a woman has he written in the past YEAR? One.... and it was Georgia O'Keefe. Talk about shut up or nut up. Even Schjeldahl, who also didn't review the solo show of a living woman in the past year, beat JS by two dead women. 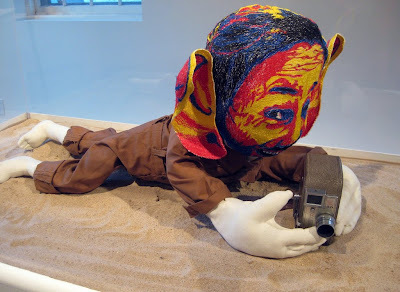 The last show of a living female artist JS has dedicated a full review to was Pipilotti Rist at MoMA, published 12/28/08. What year is it now? Oh yeah, 2010. Yes, it's 2010 now. 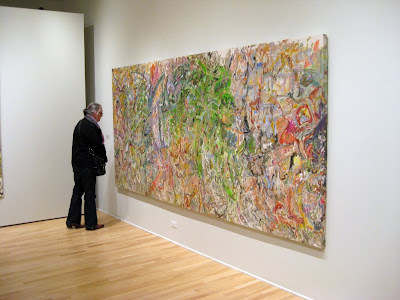 2009 was spent on Facebook calling out MoMA. 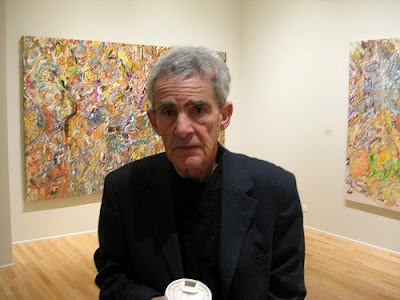 I'm half-expecting the upcoming JS Whitney Biennial review to be half-about the half-representation of women... and fully expecting his Facebook commenters to give him 87 'Like's and 470 You Did It Jer!s. Think how much more effective it might have been for them to write an open letter to Roberta Smith instead of Ann Temkin. Hah! 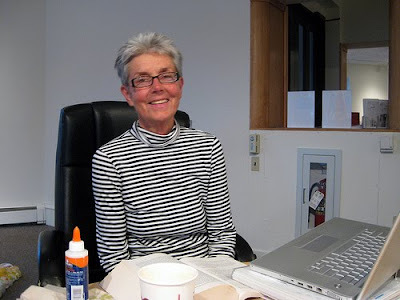 Since 2/20/09, Roberta has written fifty-four 'Art in Review' pieces devoted to solo shows, with fifteen of those on women artists. 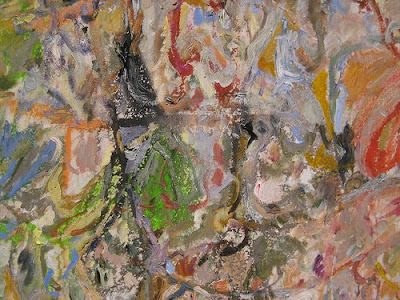 In the past FIVE MONTHS there have been twenty-four such reviews... with only FOUR of them on the work of female artists. It's a groaner that none of those Facebook people says anything. Herbert Vogel on the Cedar Bar, from the Herb and Dorothy documentary - "The Cedar Tavern was an extraordinary place for the artists to let their knowledge and anger out at the same time". It'd be nice if some old Cedar Bar regular would get on that Facebook page and go Lloyd Bentsen on it. RELATED: eageageag on Yau and Saltz. 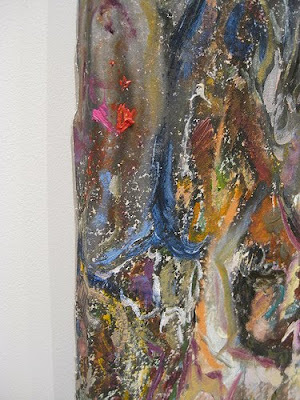 Margo Mensing, It's Not Unusual, at The Art Center Gallery, through March 27th. 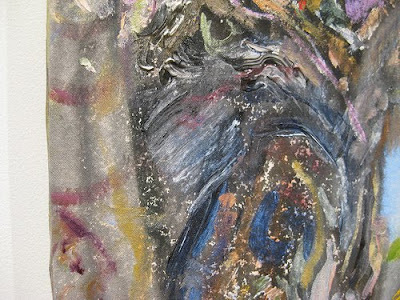 Each year - since her 63rd year - Margo studies the work and life of an individual who died at her current age... and spends the year creating artwork responding to and inspired by that person. This year is her Elizabeth Bishop year, for which Margo has been writing and sending letters... written mostly on the inside of cardboard packaging... quoting Bishop's poems and own letters, connecting Bishop's words to the lives of friends and family to whom the letters are sent. 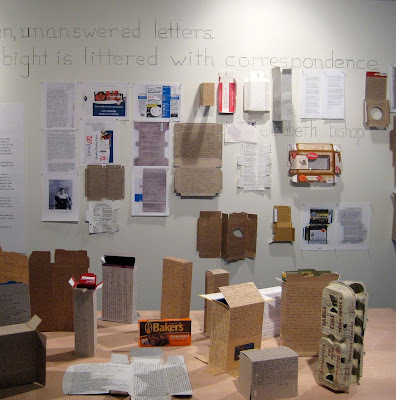 The 'letters' pictured above have been borrowed back for the exhibition, some are color photo-copies, and a few are letters to Margo in return, also written on recycled packaging. 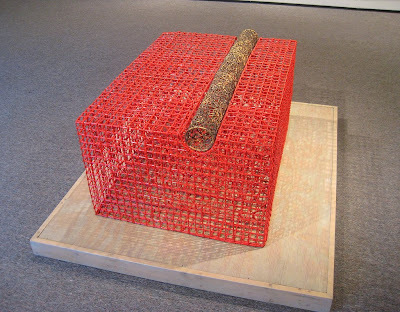 NA 708210 EFT 41875, from the Donald Judd Project. 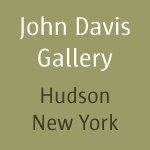 NA 708210 EFT 41875 is the name of the color, selected from over three hundred red paint chips, which best matched the red in a photo of Donald Judd's untitled 1962/1987. Originally constructed of painted Douglas Fir and plywood, copied here in willow by John McQueen. Judd Project objects were all fabricated by others, to Margo's specifications. 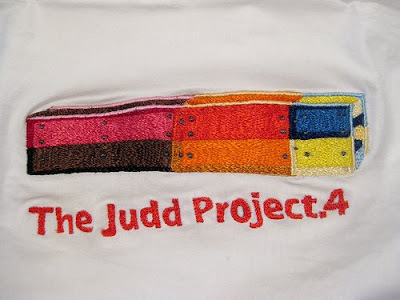 Donal Judd Project - machine embroidered t-shirts, contracted out to a shop in Tibet. 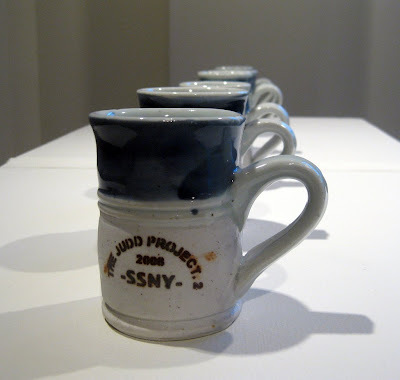 Margo found the perfect mug on a 2001 residency in Australia, a Bundanoon Pottery mug... so six years later it was an ideal specific object to re-fabricate for the Judd Project. Student potter Teddy Kunhardt was commissioned and together they made twelve, but in the end only six were decided to be close enough. Now Margo is safe if she ever breaks or loses her Bundanoon Mug. 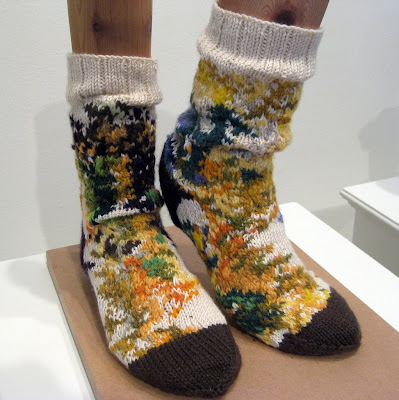 Joan Mitchell Project, for which Margo spent last year knitting Joan Mitchell paintings into socks, which were then distributed to friends and family... and she can't stop, she is still knitting Joan Mitchell paintings into socks. Really cool. 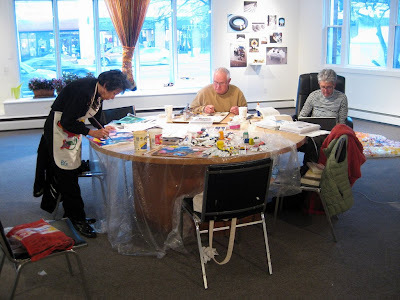 Margo is welcoming people into the gallery to make work or develop a collaborative project. On the back wall are Ian and Monica Berry's photographs of Ian's pair of Joan Mitchell socks, all taken in Miami during Art Basel. On the floor behind Margo you can glimpse part of a sculpture made by Victoria Palermo. Anyone can come... e-mail the gallery for info. 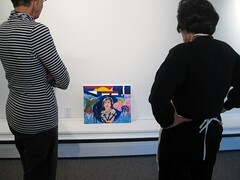 Margo and Barbara Garro studying Barbara's portrait of Jacqueline Kennedy. 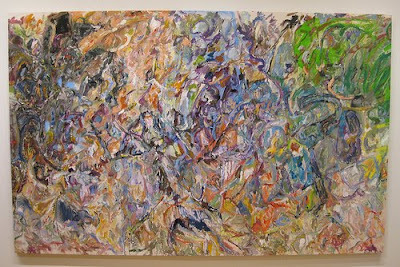 Judd fabricator John McQueen is collaging a Joan Mitchell painting, from recyclable packaging only, color-matching and shape-cutting piece by piece... it's gonna take FOREVER. Walt Disney Project - Walt Disney as a cute stuffed character... primary technicolor, Dumbo ears and Mickey hands, filming. 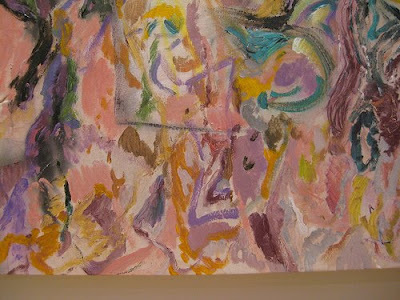 Larry Poons, Recent Paintings, at Esther Massry Gallery, College of Saint Rose, Albany. 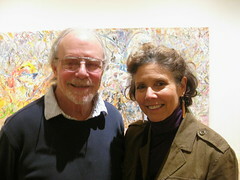 D. Jack Solomon and Jeannette Fintz. 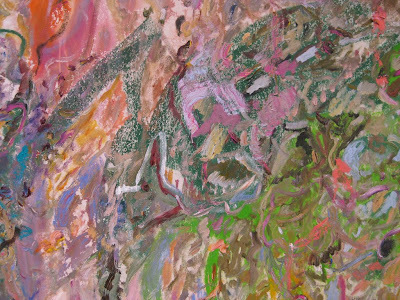 Jeannette has a show opening Sat 2/20 at Nicole Fiacco, in Hudson NY. 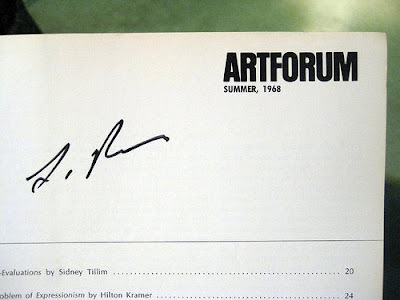 Signed my copy of Artforum, Summer, 1968.... he had the cover.